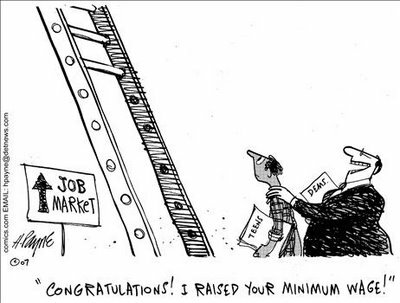 San Francisco is not the only area on the precipice of a minimum wage increase. This NYT article states that 8 states will see an increase in minimum wage on the new year. While most economists do, indeed, agree that the inevitable result of minimum wage is increased unemployment, the article, nonetheless, trots out several economic fallacies that refuse to die. “The broader economic effects of raising the minimum wage are disputed. This is the well-worn Keynesian argument that labor must be paid “enough” to “buy back” the product it produces. For an in-depth treatment of this fallacy, I suggest Henry Hazlitt’s chapter in Economics in One Lesson entitled “Enough to Buy Back the Product.” Suffice it to say that one person’s income is another person’s cost. What is gained by the worker is lost by the employer who is now less able to demand goods and services–including the services of less-skilled laborers. Secondly, the article states that some economists believe that the higher cost to individual firms (in the form of higher minimum wage) will be offset as producers pass this cost “forward” in the form of higher prices for goods and services. This view fundamentally misunderstands how prices are set. Prices are not set by the costs of production, but only by supply and demand at the time of exchange. If they were set by costs of production, no firm would ever reap a loss. Furthermore, entrepreneurs always set prices at the profit-maximizing level. If firms were able to increase revenue by increasing prices, they would already have done so, and would not wait for this legislation to “force” them. For those economists who believe that 1. minimum wage actually is beneficial to the poor and 2. has no affect on employment because businesses can simply pass the cost forward, why not make minimum wage $100 an hour? Wouldn’t that solve poverty? This ridiculous thought experiment reminds us that poverty is not cured by increasing the nominal value of paychecks–its only cure is real increases in productivity. 5 Responses to Minimum Wage: $100/hr! I believe raising the minimum wage to $12 an hr will be utimely good for workers who earn minimum wage because they the workers will have money to spend which will be a great boost for this struggling economy. That’s if the company or the employers can afford to pay them the minimum wage increases. If they cannot then there may be a problem with raising the minimum wage to $12 an hr. Johnny G. Peace out. The fallacy in that view is partially exposed in the article above. Why stop at $12? Since you think that consumer spending is what drives the economy (it’s not, and we cover that in other posts), then on your view, shouldn’t we raise the minimum wage to at least $100? Wouldn’t that really get the economy going? Of course, if creating wealth and prosperity for a society was really as simple as passing a law that raised minimum wage to $100, we would have done that long ago.